We are living in a world where a vast array of online videos are grabbing the eyes of everyone from toddlers to retirees. And increasingly YouTubers are making a living out of producing viral videos. The views, likes and subscribers add up, as advertisers pay to have their ads shown in such videos. “You get a certain percentage of an amount. Not only that, you are also asked to work with brands, and in other promotions YouTubers can create synergy to bring in cash from their channels,” said Yum-cast, whose longstanding channel has over 916,000 subscribers. A one-person media veteran with 18 years of experience explained in a YouTube video that makers can earn 2 million won to 3.5 million won ($1,800-$3,150) when a single video garners 5 million views. Then, who watches those videos? According to app analysis company Wiseapp, among some 23,000 YouTube users aged 10 or older, teens and preteens spend the most time on YouTube, with 7.6 billion minutes in April alone. In usage time among the group, YouTube was trailed distantly by South Korea’s biggest messenger app KakaoTalk, where users spent some 2.4 billion minutes. 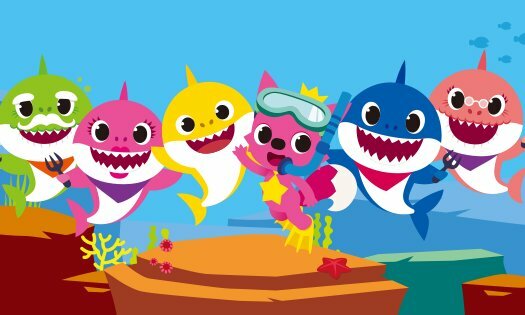 Behind the YouTube phenomenon are videos like the “Baby Shark” series of viral earworms recording over 3.3 billion combined views since the first was uploaded in 2015. The sing-along video was created by South Korean education brand Pinkfong, and it joined the likes of Ariana Grande, Drake and Calvin Harris in the UK Top 40 at No. 37 in the last week of August. Experts said teenagers, not only in Korea but around the world, are spending far more time on YouTube than any other age group. “Among some 180 million users on YouTube, many of them are using YouTube as a standard platform to not only watch but search, listen, share and even communicate via videos. It has become a multipurpose channel for those in their teens and 20s, unlike in the past when YouTube was merely a tool for watching videos,” said Lee Seung-yoon, a professor of business at Konkuk University in Seoul. For 7-year-old Jua, YouTube is more than a platform to killing time watching videos. As an amateur YouTuber with the channel Jjujjun TV having over 72,000 subscribers, she shoots herself and her brother in front of the camera drawing pictures and making crafts. YouTube creators are not limited to the younger generation or previously unknowns. Seventy-two-year-old Park Mak-rye is one of the older YouTubers in Korea. She earned celebrity status in Korea after she uploaded humorous episodes that document her everyday life with the help of her granddaughter. Under the channel Korea Grandma, she posts videos on topics ranging from makeup tips to her adventures abroad. K-pop stars like Luna from f(x) also run their own YouTube channels where they upload goofy videos, behind-the-scenes clips and promote their music videos. Some even use the channel as a tool to show different sides of themselves. According to a survey conducted on 1,000 South Korean men and women aged 15 to 60 by Korea Internet Corporations Association in March, over 79 percent of 50-somethings said they use YouTube to watch videos on their phones. This percentage was slightly higher than 30-somethings (77.3 percent) and those in their 40s (77.4 percent). Another survey result from Wiseapp also showed that Koreans in their 50s spent 5.1 billion minutes on YouTube per month, compared to those in their 30s and 40s who spent 4.2 billion and 3.8 billion minutes, respectively. More YouTube channels targeting seniors are popping up as older generations become major YouTube viewers, absorbing information and enjoying their favorite shows on the video platform. For instance, conservative one-person media channels cater to senior viewers. However, viewers’ discretion is required, experts said, because some such one-person news commentary channels often churn out fake news or unchecked information. “Such videos can create bias, since creators believe what they made and uploaded on YouTube is fact. This makes watchers, especially those in their 50s and 60s, easily believe what they hear and watch,” said Lee Taek-gwang, professor of British and American cultural studies at Kyung Hee University in a recent radio interview. As for such concerns, YouTube has released an official statement that it is vocal about its efforts to curb the spread of fake news. Na Dong-hyun, better known by his alias “Great Library,” is one of the most influential YouTubers and top live streamers in South Korea. Na said one-person media is not a revolution of contents, but a revolution of media circulation.